It's always the cactus that someone else would call ugly or dead-looking that I not only like but find absolutely beautiful. Partly, I just like weird things. Emus, for instance, are gorgeous and awesome. Everyone has their own type of preferences. But the strange cactuses always give me so much to ponder. Some look sculpted, less about lush foliage and more about the shapes that they make. Like my night-blooming cereus, which has skinny arms that reach like tangles through the air, journeying this way and that. Plants like this are poetic in the way that they live. This picture is from a couple years ago; the plant is much, much taller now. Is it alive? Does it look alive? Oh, yes, it's alive--believe it, it's thriving. Hey, it lives a little differently than a rose bush or an apple tree does but it isn't a rose bush and it isn't an apple tree. Its very life is defiance of death. No water? Hey, that's okay, I can make it, anyway. Piles and piles of sunlight? That's cool, I'll manage. Give me the worst; it makes me thrive. Just watch me; I turn death to life. Those who look at me and think I look funny, they don't understand, and that's okay. I'm a living, dead sculpture, and that in itself is enough to celebrate. The cactuses that express all that life is, in beautiful sculptures, are the best of all. The newly-released teaser trailer for Star Wars: Episode IX was indeed simply a teaser. Two minutes is a decent length, but it was careful to not show much of anything--which frankly made it somewhat boring to me. But of course, anything that they do show gives us the chance to guess and surmise and theorize. So let's commence with my thoughts on all that (not having seen anyone else's thoughts yet). Small note: what's with the Rey panting for the first few seconds? I know it's probably trying to evoke her feeling the Force for the first time on Ahch-To, but I found that a weird and unnecessary way to start the trailer. Luke's narration feels repetitive, like ground we've already covered. But again, it's a teaser, so they have to kind of focus on the ground we've already covered to get us excited for what's coming next without actually showing us what's coming next. And then we have the princess theme playing even though we know that there can't be much Leia in this film--but it stands to reason that her role would still be significant. Rey's outfit at the end there is a combination of her standard look and the Leia white robe/dress (it's the color plus the hood). So we can assume that when Leia dies, Rey in some way assumes her role. And what was Leia? Hope and a leader. I don't care for the whole long buildup to Rey flipping into the air to spear Kylo's ship (that is his ship, right?). Sure, some action's good in Star Wars, but it shouldn't be the focus (again, it's just a teaser trailer, so this doesn't mean that it'll be the focus in the movie itself). And weren't some of the silly flips and all one of the things that made the prequel trilogy a little . . . less than perfect to many viewers? What I want to know: what do we see of Kylo in this trailer? Very little. We see more of Rey because we know what Rey's up to already so it doesn't disclose any secrets to show her. But what will Kylo do and what will happen to him? We see him fighting (presumably still on the wrong side) and we see his helmet being mended. Yeah, it's stretching things, but we don't really know that he and Rey were fighting--what if they were training together? And is he really the one mending his helmet? Isn't he done with that facade? It wouldn't make sense for him to try and put it together again, would it? It's broken and he's broken and now he wants his real rage to show on his face because he's done with putting up a fake facade of rage--he has the real kind now. So that does make me wonder if it's someone else--or if there is a specific, random reason for the helmet to be put together again. Because remember, artifacts have been very important in the sequel trilogy. The Aftermath books had all sorts of random characters collecting items that had belonged to the Sith for rituals, etc. Kylo kept Vader's mask as a sort of idol. What if the masks have something to do with the return of that laughter at the end of the trailer? Of all the characters we all expected to see come in or return, the Emperor probably wasn't one. I keep expecting Vader or Anakin to come back in one form or another. It was always a question of whether or not Snoke was truly dead for good. But the Emperor? Unless, of course, Snoke somehow was the Emperor--but the books seem to disprove that and put him as a separate persona. I mean, unless somehow it isn't just Jedi who've achieved balance in the Force who can appear as Force ghosts. Maybe the Sith have a way of returning as dark spirits--maybe that's all we see. Or maybe the laugh is just part of a vision that Rey has. That title? I don't like it; it doesn't roll of the tongue. I guess it doesn't need to, though; we'll all just call it Episode IX, anyways. I don't think that the title is confirmation that Rey is a Skywalker. We've covered that. It could mean that Ben Solo returns, that Kylo finally ends. 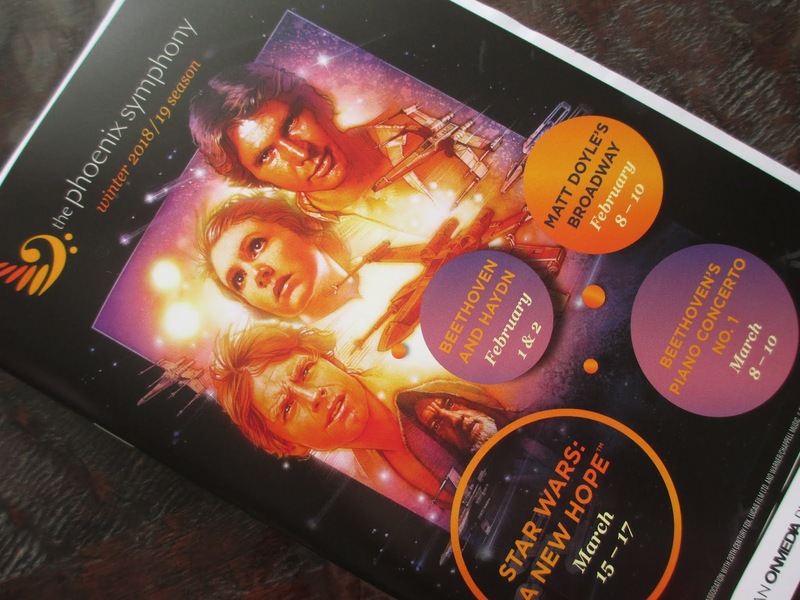 But I keep thinking about how the art book for The Force Awakens mentioned that the first thing they did when beginning work on the new trilogy was to answer the question of who Luke Skywalker was. The Last Jedi was all about dispelling the myth of Luke Skywalker. Maybe this film will be about bringing the myth back, in which case The Rise of Skywalker refers to the return of the myth. So Rey could in fact be the one continuing the myth, becoming the new figure that carries on the hope. Or it could still be Ben, or Ben and Rey together (or their child . . . oh, it's just one film, okay, maybe not, that's fan fiction, eh? then again, the whole Force bond thing was literally fan fiction, too, and that made it into the film). So I don't overly care for the trailer itself. But I suppose it did its job of giving us a little tease. I guess it was the whole "small chocolatier" thing (out of Scotland, no less) that drew me to Coco Chocolatier. And while I've never had a gin and tonic, the ides of a Gin & Tonic Dark Chocolate sounded like something worth trying, something a little different. At first I thought the colors of the packaging created a cool vibe, but now I'm split. They remind me of the watercolor paintings that (less than high end) hotels used to have in their rooms in the '90's. Then again, a dress at Anthropologie right now reminds me of those same paintings--so maybe the look is coming back in? The bar itself comes in that standard mold with the small rectangles that are about the size as in a Green & Black's bar. Great size; I approve. As you can tell by the bloom, I did let this bar sit for quite a while before I got around to reviewing it; sometimes that just happens. Add to that the fact that I've been so irregular with posting lately and, well, you get some bloom sometimes. Nothing special to the chocolate's aroma. Just smells like standard dark chocolate. As far as texture, the age did unfortunately show in this area, as well. Old chocolate gets kind of hard (and it takes months and months for chocolate to get old, so sorry), so I went ahead and chewed a little to get it all melting and releasing flavor. Otherwise it would have been quite a slow and strange process. I do taste something other than chocolate. It was hard to say what exactly. Some "alcohol" chocolates have an alcohol taste to this one, but this one does not. It also, by the way, does not contain any actual alcohol (some chocolates do). As I mentioned, I've never had a gin and tonic. I've only had gin in mixed drinks, so I don't necessarily know what gin on its own tastes like. From this chocolate, initially I was trying to describe that other taste as sweet, something akin to vanilla and marshmallow--but that wasn't quite right. And you know what, there is the ingredients list right there available to see. It contains vanilla flavor, juniper oil, lemon oil, and lime oil. One bite reminded me of Santa Fe for a second, perhaps of the drinking chocolates at Kakawa Chocolate House. Perhaps it's that combination of less usual flavors (like juniper) that created that old world feel (though I don't recall any of their chocolates having juniper specifically). Either way, likely it is the juniper that gives the chocolate that unique flavor because juniper is something that you come across less often in chocolate (I do believe I've had it in chocolate before, or at least something similar). And while I did say that there was no alcohol taste to this chocolate, a couple pieces in, I did start to get an aftertaste that reminded me of drinking an alcoholic beverage. That sort of zingy, deep flavor. So while I can't say if this chocolate specifically evokes a gin and tonic, it is interesting. Likely, as well, the flavors would have been better and more pronounced if I hadn't let this sit on my shelf for months before opening it. I'd say the chocolate itself is fairly standard good quality--and being able to put together something nice with a "stranger" flavor combination is an achievement for Coco Chocolatier. I'd be interested if someone offered me more from them. Nice as it was to see The Barber of Seville last year and then its sequel, The Marriage of Figaro, this year, I quite honestly probably just wasn't in the mood for such a lighthearted story on that particular day. The story is full of fun comedy--and a little bit of iffy comedy. Yet it was when the Countess (performed by Katie Van Kooten) was singing about wanting her love to come back to her that I was all bawling. It brought somewhat to mind Madama Butterfly. I do prefer the melodramatic, don't I? Give me three hours of lighthearted comedy and all I latch onto is the touch of pain. That's how art is, though, isn't it? You can sit an audience in front of the exact same show and we're all going to come out with different experiences. That's why so often art will feel like it's speaking exactly to you: once it's unleashed on the world, it becomes a mix of what the artist gave it and what the viewer gives it. I wasn't planning to get on the soapbox about Easter chocolate again this year. I was just going to quietly say, hey, here's some alternative chocolate. But I picked this bag up too quickly at the store. I didn't notice until I sat down for my review that while it's organic, it isn't fair trade. Still good, but not quite the angle I was going for. I guess the good thing about all this is that fair trade chocolate is becoming so much more common that I took it for granted that this one was. So let's go ahead and see what this chocolate has to offer while I have it here. The bag comes with a resealable top, which is an unnecessary addition of material: the chocolates are individually wrapped. The white wrappers have orange decorated edges to evoke painted Easter eggs. While the look might not quite compete with the shiny wrappers of most candies, they aren't really trying to replicate that look, anyway. The little eggs are only rounded on one side; the other side is flat. Imprinted on them is an image of a baby chick hatching from an Easter egg. Here I'd call it a pretty similar approach to the Palmer's bunny that decorates much Easter chocolate. Like most of the peanut butter chocolates coming out these days, these are fairly comparable to Reese's Cups. Of course, not exactly like them, but different companies are finally settling in on what makes Reese's so popular. The salt is there and also that semi grainy or crumbly texture to the peanut butter. The chocolate isn't as greasy, which is technically a good thing, but you know, that greasy element is part of what makes a Reese's Cup a Reese's Cup. You can also taste more chocolate here than with Reese's. 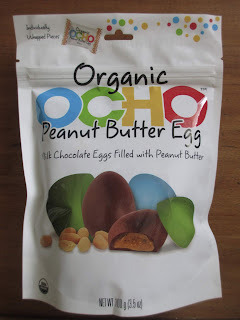 So if you are going for better ingredients for environmental reasons (organic keeps it all safe from pesticides) or for feeding your family better (some of the ingredients we eat regularly without blinking an eye are downright disturbing), these are a good option. Organic is a step, yes. And they taste good. They're close enough to Reese's to taste fine to those used to the usual candies. And for those who are just used to alternatives, they'll be completely satisfactory. 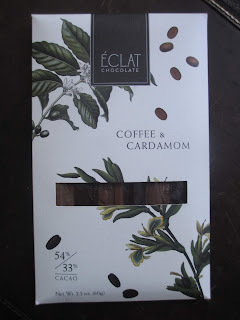 I just hope that we can keep on taking steps and get to more fair trade chocolate, even if it means we eat less chocolate overall (which I realize sounds self-contradictory from someone who regularly reviews chocolate, but there you have it). You know, I never feel like I share the experiences of people who talk about the role models that Star Wars characters were to them while growing up. Except that, the more I think about it, the more I think that Padme might just have influenced me more than I realize. After all, I was about eight when I watched The Phantom Menace and we watched that movie quite a bit in my house--being that we didn't own too many movies and being that it is, after all, a good movie (not perfect, sure, but few movies are). One of the great things about it is the introduction of two great Star Wars female characters (a topic which is talked about so much for characters coming out now): Padme and Shmi Skywalker. While I must reluctantly admit that there will probably never be a book about Shmi, at last we got a book, Queen's Shadow, about Padme. A book written by E.K. Johnston, no less. How exciting is that? I keep talking about reading or watching things at either the right or wrong time in one's life. When I was maybe a third in, I thought maybe this was a bad time to be reading this book--for reasons I won't get into. But then the reasons changed and developed and it became quite a fitting time. The title refers to two things. There is the plot. Padme is shifting from her role as queen to senator and adjusting her approach accordingly. What worked when she was queen doesn't when she's senator, so she has to get out of that shadow even while using what she gained from it. There is also Sabe, her closest handmaiden (and her main body double aka. Keira Knightley in the movie). Much of the book is from Sabe's point of view, not just Padme's. So you have this character who is freely choosing to live behind this other person, to literally become her when needed: she is living in the queen's shadow. The book answers many questions--or rather fills in many details. The shift from Padme in Episode I to Episode II (why does she act so different?). The elaborate costumes. The handmaidens. Simply Padme's voice in it all. The movies show what they can, but they're not from Padme's perspective, so I think a lot is left to the audience to infer--and some audiences maybe don't quite bother to go into her perspective. So this book shows what types of things go through her head. It's so funny. I'm going from realizing that maybe this character did influence me to realizing that we have much in common. Not . . . everything about her. Just certain things, certain things that reading this book made me ponder. And I guess this was kind of a pondering book. It wasn't so much about plot as about that transition that Padme made to being a senator. So it has all of the thoughts she has about her past, present, and future. While politics make up a certain percentage of the plot, E.K. Johnston has that talent to bring everything right back to character. It was all about the characters and not about the political plot points. 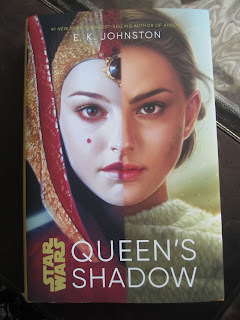 Interestingly, as well, this book shows Padme apart from Anakin, during the time that she didn't seem him at all and so only thought of him rarely and in passing if at all. That's quite important. Much as I like Anakin and Padme, all this shows that she was her own person before their relationship. It makes her eventually "fall" more a tragedy that happened to her than something she brought on herself. If Padme didn't bring the fall on herself, even if it did come, maybe I won't, either. Heading over to see what Southwest Shakespeare Company has going on at Taliesin West always turns out well. The Death of Kings: Seize the Crown was performed by a group from UC Santa Barbara's Department of Theater and Dance. The play itself combines eight of Shakespeare's history plays, only one of which I have watched. Frank Lloyd Wright's little theatre up at Taliesin is already such a strange (in a good way) spot to see a play. This played used the space differently, bringing the back "wall" of the stage farther back than in the other plays I've seen there. The other plays have had small casts, usually just a few people. This one had a little over a dozen. So they did need a bigger physical space--and yet they were still in the smaller physical space of the theatre itself. I talk about space because this production emphasized the use of space and visuals. They had that not-quite-abstract, artistic approach. The same wooden poles in the hands of the cast could represent either the swords of the battlefield or the wood that burns Joan of Arc. The physical passing of the crown from one monarch to another was a theme in and of itself. And red light or red hands or red cloth, well, I'll let you imagine that. It was all done in a fluid way, though. Sometimes such an approach can feel like the actors are pretending to show something happening; but the approach here was, instead, a direct representation of what was happening. Although the cast was on the bigger side, most were playing at least two or three roles, in addition to being part of the ensemble. The 90 minute play, after all, puts together eight plays. The whole play, then, was much about the overall concept of changing thrones and yet also about each moment. In this moment, this actor is this character and they are playing out this scene, even if they were a completely different character in a completely different scene just a minute ago. In this way, they took the pressure on themselves instead of putting it on the audience: we were free to just sit back and watch it all unfold, not needing to worry about keeping track of who's who or what's happening. Indeed, the carefully placed snippets of narration also worked to provide whatever guidance the audience might need. All of these pieces of plays came together to create something dark and dramatic and exciting and funny and thoughtful. The concept of different generations falling and rising brings up questions of what we are doing in our own time, or how the present would look as just a single strand in a whole stack of events. What would you choose if you were being watched in the pages of history? Someone tell me, why do I keep bending my chocolate rules? This chocolate says nothing about being fair trade; it just says it's non-GMO (which is good) and suitable for vegetarians (which most chocolate should be, anyway). But it's from World Market, it says it's handcrafted in England, and it's a banana chocolate. So I bought it. The overall style is casual. The bar comes in two layers, white chocolate over caramel chocolate (or 33% milk chocolate). It smells as you'd expect, like cream and banana--specifically that banana flavor that isn't one hundred percent true. More of a banana flavor than the flavor of banana. The ingredients do list "natural banana flavor," but I would imagine that could mean a variety of things. You know what it tastes like? Duvalin candy. You know, that Mexican candy that has the little plastic dish and a plastic spoon to scoop out a creamy paste that's some combination of brown, pale yellow, or pink. I don't entirely know why, but I love that stuff--so I'm also loving this. The resemblance is strong, though this chocolate isn't as plastic in texture as the candy is--and certainly it should not be. I can't exactly offer much more praise than to say that I like eating it. It's a sweet confection flavor of somewhat faux-feeling banana along with cream and caramel. Caramel that is almost more of a toffee flavor or a hard candy caramel. It's all super sweet and gets a bit greasy and there isn't anything to note about the chocolate. 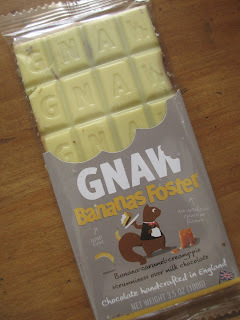 I've also had better examples of banana chocolate. And yet all of the things that I want to call less than perfect about this chocolate are what make me enjoy it so much. Well, if we like some things that logic would convince us are not for us to like as much as we do, well, I suppose that's okay. I don't expect to be buying anything more from Gnaw just because they do bend my rules, but this bar is certainly disappearing quickly. So if you don't have my rules and you want a chocolate banana confection, go for a try. I always end up stalking that little owl wearing a cape and hat--because I love it but I don't collect plushes and sometimes you just really need to stick with rules of what not to buy. For those confused (probably everyone), the little owl is the one from Sleeping Beauty. When Aurora is in the forest recounting her dream, the animals find Philip's things and hold them up to create the companion Aurora speaks of, the physical "person" she can dance with. The owl wears his cape and hat while the rabbits take his boots. And then, of course, he discovers them all and takes the place of the animals in order to sing back to Aurora's song. I was there in the Disney Store, holding that plush once more and saying that if they just made it in a figure instead, I would buy it. And then there it was, a figurine playset celebrating the film's 60th Anniversary that contained the said beloved owl. Aurora and Philip and Maleficent, et all, as well, but the owl was the one that made that set mine without a blink. Ah, I love the 60th; it also brought me a wonderful set of pins last month. Sleeping Beauty is one of my favorite Disney animated films. I loved it first because I got the DVD on a trip to Disneyland, then because I loved the art and the music. Then I loved the good versus evil theme. And the way in which Philip fights for Aurora, the way that he loves her even when she's just a random girl he met in the woods, not a princess. The way that she dreams of him and then meets him. Provided you go along with the idea that it is a piece of art rather than a description of the reality of meeting and falling in love with someone, it is a beautiful piece about love. And about good versus evil. I'm all about the good versus evil stories. Maybe the two, the love story and the good/evil story, combine and that's also why I love this movie. There is that two-sided element to all of it. Darkness in Maleficent and her abode and the thorny shadows she brings to the kingdom. Beauty in the jewels and the castle and the living forest and in Aurora herself. Feminine elements in Aurora, the fairies, the dancing and the singing. Masculine elements in Philip, the sword fighting, the dragon, the flames. A balance between two opposing, complementary elements. Oh, and a little owl wearing a cape and a hat. I'm sorry for what I did when I couldn't breathe. I'm sorry for what I said when I couldn't see. Did I let the chaos out? Now you see why I need to contain the chaos. The stars only shine by burning, but we only love their shine because we forget that they're burning. I'm sorry I let you see me burn. I burn best in silence, where you can't see me. There are many different things that you might mean if you start talking about better quality chocolate. For the sake of the current product, better quality refers to fair trade ingredients and also somewhat more environmentally-friendly ingredients--and the greater availability of products like this. This bag of Dark Chocolate French Sea Salt Wildflower Honey Caramels from Money on Honey came from Walgreens. The chocolate and the sugar are fair trade. And the name comes from their use of honey instead of corn syrup for their caramel--they went ahead and went a unique route, put their money on the honey. Given all the products with genetically modified corn in them, I'm all for using less corn syrup; and given how great honey is, I'm all for using more honey. The bag is basic; this is still just a mass-produced product. The chocolates are gold-wrapped basics. 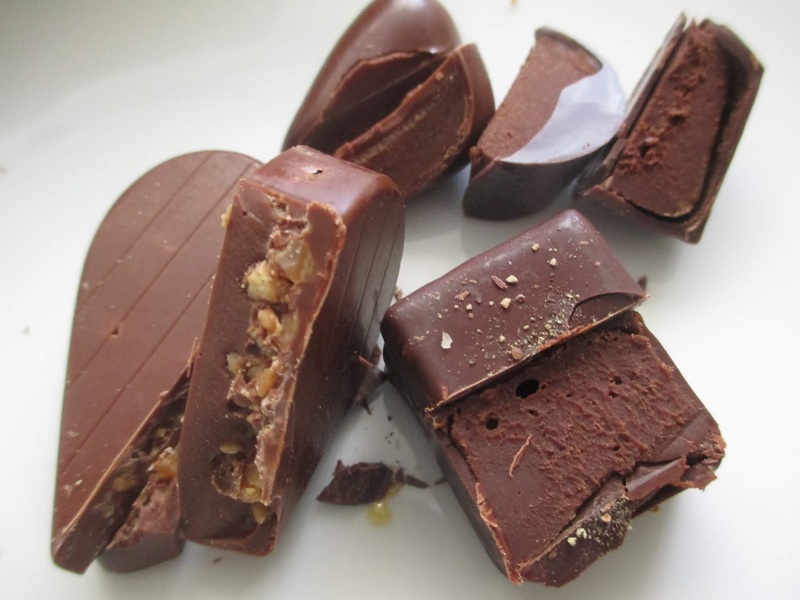 Dark chocolate pieces come with fat flecks of salt. They cut pretty cleanly because it's a pretty stiff caramel. A couple of chews in and you can taste the honey strongly. I don't think I remember tasting honey so strongly with the caramel from Untamed Confections. Maybe that's because Money on Honey specifically calls this Wildflower Honey Caramel rather than just caramel made with honey. I'm certainly not complaining: honey is an excellent flavor, just as rich as it is sweet. The caramel takes center stage on this one. As such it's hard to really get a grasp on the chocolate, which is to be expected, though. Sprinkles of salt come in strong and sharp gasps. Now, that caramel truly does taste of caramel and of honey and not even so much of vanilla like caramel often does. So I would say that this is a unique caramel flavor. The flavor plus the soft and chewy texture make these pleasant confections. So I'll give my stamp of approval. Long shelf life, better ingredients, pleasant flavor, fair trade. When you get all of these things in one, that's an overall improvement to the chocolate/candy scene. When the Phoenix Symphony does something like performing the score of Star Wars live to the movie, the idea is usually that they're going to be bringing in an audience that doesn't normally go out to symphony hall. 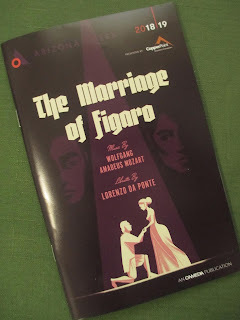 While granted I've never gone to one of Phoenix Symphony's own productions, I've hard them many times (for operas and ballets) and I've been to Symphony Hall many times--but this was the first time I had been to see a movie score live. So kind of opposite for me. The concept had always seemed novel, definitely something I wanted to do at some point. I found out about this one kind of late on and thought, you know what, this month is the month of show after show for me, so why not just go for it. I highly recommend doing the same if you also have the opportunity to see a movie score you love live. It's exactly as amazing as you would think that it would be. I've never seen A New Hope, so seeing it on a bigger screen and with an audience was nice--but also meant nothing compared to what it was to hear that music live. The sound is different when you see a movie like this because you're not really there to watch the movie. So the music is louder and the rest of the sounds of the movie are somewhat quieter than they would be in a movie theatre. You can still hear the dialogue and effects, etc. ; it's just that the score takes center stage. Visually, as well, yes, the screen is big, but it doesn't take up your entire field of vision like in a movie theater. And instead of performing half in hiding like they would for an opera or a ballet, here the symphony was set up on stage. The conductor had his own smaller screen in front of him to show the movie along with the "moving target" to help him maintain timing. That's the amazing thing: they have to stay in sync with the movie that is playing on the screen. That this score in particular is a powerful score we already know. I perhaps needn't stress that. I'll just say that yes, it is indeed strong and triumphant and tender and soft and exquisite and bold and touching . . . and powerful. And hearing it live only makes it more so. Ha ha ha, Spring Break, Winter Break, three day weekends--these are phrases that not freeing and leisurely when you work in certain industries; rather, they are terrifying. When you're the person working so that everyone else may take their leisure time, all you do is work during their leisure time. So . . . even though I've had things to post about (since there are an abundance of shows going on this month and I seem to be making it to them all), I just haven't done so. So I'll go ahead and bundle Southwest Shakespeare's latest plays into one post. They ran them together, anyways, so I suppose it's fitting enough. Now, often when they do this, there is one play that stands out over the other. This time, though, I was impressed with the quality of the performances in each one. The two plays in question are The Taming of the Shrew and As You Like It. Probably it's easier to say that the former was the better one. But that's because it was filled with humor and laughs and to have the audience constantly responding to all of that wittiness and energy was an experience. However, the delivery in As You Like It was just as much of quality; it was just less humor (although there was still certainly some). The Taming of the Shrew was the play I was completely unfamiliar with. I'd heard of it, of course, but not much else. Knowing that it's one of those plays that can be . . . problematic for the modern scene, I found that they did very well with it. Maybe I'm just used to viewing things in context of timelines, but I wasn't offended by this play and I even felt like much of it could have been written today (as opposed to so many of my dear Victorian novels that I love but are definitely often quite dated in certain respects). So whether this was the careful choosing of which lines to use or the delivery or just the overall strutting and direction of the play (or most likely a combination), well done to everyone involved. It was just a fun comedy, making everyone laugh at the silliness of humanity and then ultimately ponder what our statements and our actions really mean in the end. What As You Like It did best was to create that sense of the forest of Arden. Arden is that place that is a state of mind. Given that this play used the same set (a heavy structure with a balcony and doors and stairs) as the other (since the two were running at the same time, of course), I wondered how they would create the forest. Turns out they introduced it bit by bit. As the characters spend more time in the forest and get, in a sense, mentally deeper into the forest, the entire forest overlay emerges. Wonderful there. Once more, this was one of SWS's plays to feature music throughout. And in this case, the music helped to create that sense of the forest as this single moment in time, this state of mind, that helps the characters to ponder who they are. Pondering, pondering in the forest that is our minds. Both plays, though different, contained that sense of pondering the self. We're in this forest--who are you and who am I? Do we know or do we have yet to discover? The discovery is a journey, that is certain. Probably you have heard the story of how soldiers during WWI laid down all hostilities for one day, for Christmas Day, and intermingled and played games and acted as friends and comrades, and even though they went back to fighting the next day, for that one day, Christmas Day, they had put all of that aside. This is the story that Arizona Opera's latest production, Silent Night, was based on. That is, the opera, with music by Kevin Puts and libretto by Mark Campbell, was in turn based on the film Joyeux Noel. Perhaps that was why the piece flowed along much like a film would rather than an opera. Even though you could sense that the audience was moved, there weren't any gaps that allowed for the usual pauses of applause that are the norm for opera (opera audiences love to show their appreciation). In fact, that was just as well: pauses and applause would have removed the audience from being inside the story and this was one of those pieces that just pulled you in and kept you within the world. Also seeing soldiers and bits of battles was different from usual at the opera. But still we had the main thing: music and singing that moved us emotionally. I've talked about maybe the shedding a tear thing at an aria, but the first act of Silent Night pretty much just had me weeping. This is where I start to wonder again if it's just me--except that this music won a Pulitzer Prize, so no, it isn't just me. The story is war . . . and war stories are about people who are coming from all phases of life to a horrible existence. The mothers, the fathers, the children, the friends, the lovers, they all got their moment, each moment a chance for the audience to connect and weep at the idea of what that would be like--that is, for those of us who have been so fortunate as to not experience events quite like this. For those who have, well, that would be even another layer. The performers in this sang the song of life . . . of heartbreak and pain and beauty. That's what made this opera so poignant. I will state that, while the first act just left me utterly stilled, the second act didn't have the same power. I would rate the piece as a whole higher if there hadn't been that difference between the two. 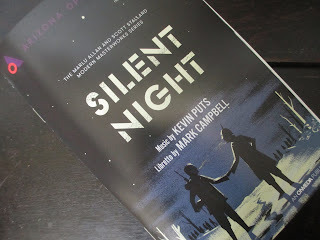 Still, though, Silent Night remained a beautiful story of the deepest and most touching aspects of living. The first time I saw Lucia Micarelli was when she toured with Josh Groban on his Awake tour a while back. That was one of those times where you could say she blew my mind with her violin playing. She also introduced me to a new approach to music and helped launch my interest in music in general: I hadn't been listening to music much on my own before that. That was the time that I started browsing iTunes and Pandora to seek new things. So when I had the opportunity to go see her again this past weekend, well, I had to go and see what it would be like to go and see her again years later. She was playing at the Highlands Church in north Scottsdale. A good-looking, big church where it seems they have many such shows. Given the style of Lucia's music, I was a little surprised to see that I was practically the only person there who wasn't retired. (Not entirely unlike in fact going to church, then, eh?) But I hadn't been paying attention to the fact that this show was just one night of Arizona Musicfest. People were going for Musicfest, not for Lucia specifically. So then knowing that I might have been the only person there who had seen her play before made me excited to see how she would soon blow their minds, too. She has certainly been working at her craft over the years. Now she incorporates more straight classical music, the intense pieces but also the delicate pieces. And the fiddle tunes highlight her liveliness. She also does some singing now. Her voice is exactly as it would be: rich and full and from the soul. I want to say that she has something of a jazz sound to the way that she sings. It is possible that she drew some tears from me. Maybe it's just me; all the shows I watch nowadays end up having these moments of being beyond amazing. No, no, Lucia's music is that good. And then it came, the same duo of songs that she played at Josh's concert years ago. "Aurora" and "Kashmir." Her intense violin playing running into rock violin playing. You could feel the audience reacting in pleasure and awe. Lucia isn't the only one nowadays to blend genres . . . but she does it better than any other violinist I've seen or heard. Her intensely emotional style is unlike any other. I used to post about movies fairly regularly. I guess that stopped when I stopped watching new movies as often. Now I watch shows and YouTube. All those Disneyland videos are great for having on in the background while cleaning and such, but they do certainly end up taking up time, don't they? (Looking at you, Fresh Baked.) The reality is, I just watch less movies these days. I did watch one recently, though. One that's been in my queue for years, as most of them have been. At this point, I browse my queue rather than other pages when I'm looking for something to watch; there's just so much in there. Anyway, I finally got around to watching Eternal Sunshine of the Spotless Mind. Definitely there are aspects to this film that are very much me. Simply the style of it with that non-linear quality and with the emotions going in the forefront, above plot. Also the type of characters and relationships. The type of thing I tend to end up going for. But what I want to focus on is a more general concept. Specifically, the movie talks about the idea of inevitable flaws in relationships. In a more general sense, though, I'm going to broaden that out and take it to life as a whole. Just as no relationship with be perfect and so you have to decide that you're willing to go through all the imperfections with someone, life is not perfect. And you have to decide to go through and take what is good and just work through the rest. This movie stated that concept in such a matter of fact way. And all of the chaos that it took to get to that final statement in the end is quite a perfect reflection of how that realization happens in reality. Life is hard. We get pulled in all sorts of directions and we get confused and muddled and not sure of things. But when you realize that oh, this is how life is . . . and that's okay--that's a good place to be in. "Eternal sunshine of the spotless mind" . . . is that something you want or not? It's tempting to think of the mind living in endless sunshine with not a spot in sight, but in reality spotlessness has nothing to do with reality. In reality, there are spots. And taking away the spots takes away all the good things, too. So we can think of the concept of eternal sunshine . . . and we can just be content with working with all the flaws. Okay, I've probably been bending the chocolate rules a little too often lately. And normally I wouldn't bend them for packaged chocolates (that is, chocolates with a long shelf life versus fresh ones that only last two weeks). But World Market just gets me in the shopping mood, I guess. 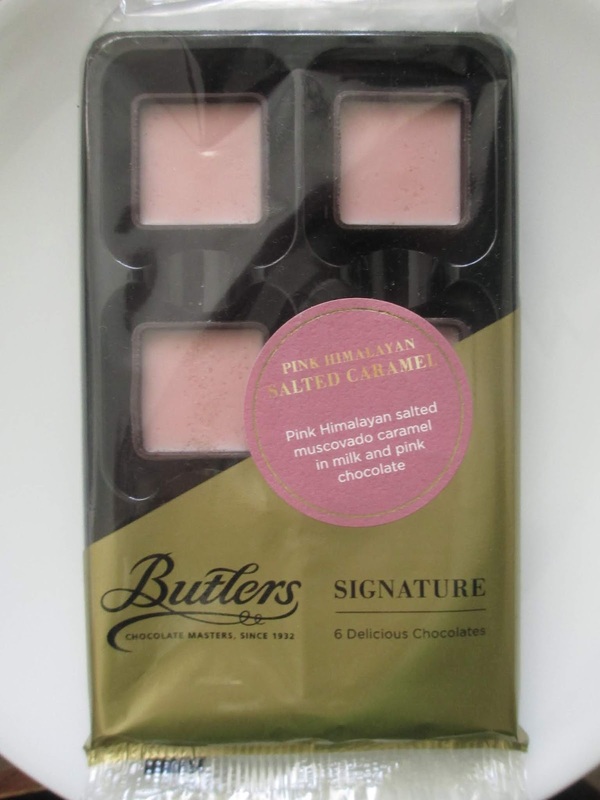 And I fell for the whole pink Himalayan salt and pink chocolate thing. In fact, the pink chocolate is white chocolate that has been colored with beetroot. This way it looks the same color as pink salt. It's pretty. Honestly, as well, I was interested because Butlers Chocolates is from Ireland and I don't know if I've ever had any chocolate from Ireland. Just seeing the different ways that various countries approach chocolate can be worth bending the rules a bit occasionally. I do appreciate that these are labeled as chocolates and not as truffles. Structure-wise, they're little, square chocolate cups with the top half of the inside being pink chocolate and the underneath being caramel. There is some salt on top, too. Very much the look of a dessert. You definitely get a sweet, slightly chalky-flavored confection chocolate taste. There is, after all, white chocolate; that's where that chalk-reminiscent taste comes from. Now, the label calls the outside milk chocolate, but it's 58% cocoa. Americans would call that dark chocolate, so there is one little detail that's different with this being from a different country. Again, I kind of appreciate it being called milk chocolate because it certainly isn't dark. It's kind of a standard middle ground confection chocolate. The caramel is nice, flowy and vanilla-flavored. Interesting way that they further reinforce the salted caramel aspect: there is salt on the bottom of each chocolate. So it hits your tongue as soon as you bite in. Pink salt is less salty than standard salt, so they did have to add a visually noticeable amount for it to be salty. It is certainly a noticeably salty flavor, though not too strong, either. Definitely a good balance. So it's a nice little salted caramel chocolate, it's pretty, and it has a long shelf life. As chocolates with long shelf lives go, certainly this is one of the better ones. While not perhaps the best chocolates I've ever had, they're quite nice. The water has changed. Perhaps. I don't have a fear of water. But I don't like aquariums, that sort of thing. Even the fish tank sections in pet stores can be a little uncomfortable to be around. So it took me a little while to make it over to Odysea Aquarium. There were likely a variety of factors involved (one being that their tanks are newer and cleaner than some and also better lit and smaller than some), but the tanks didn't much bother me. A little . . . but then it faded. I worried before getting to certain sections that I thought would be bad . . . and then wondered why I'd been worried. I think I've mentioned that water is an element in my next book. So I'd thought that if I ever went to the aquarium, I might even want to bring a notebook to get some material. But there was nothing for me to write down. Which, in fact, is quite fitting. Like most symbols, water has two sides: the good and the bad. Water is life and water is death. Like how red, for instance, is both love and hate. It's that flip from one to the other that I'm trying to explore in this book. Maybe that's why I haven't been working on it lately: I needed to flip myself before the theme could. Aside from the fact that The Firebird was a premiere, Ballet Arizona had me at the mention of La Sylphide. A story about a man falling in love with a nymph and pictures suggesting that they'll be dancing around the woods? Count me in. The latter played first and was the longer of the two pieces. It was lovely, reminiscent of Sleeping Beauty that I adore, except that this was new to me. Everything created that concept of magical love, love that sweeps James off his feet, not necessarily for the better. I do wish, though, that for the sylph's costume they chose something a little more nymph-like than ballerina-like. She was pretty and played that entrancing beauty, but I wanted a touch more fantasy and a touch more of a feeling of the woods in her look. Still, I could have gone to watch just this piece and been happy. And then came The Firebird. Here I don't understand the main promotional image. I don't understand the name. Unless I slept through that part (not to say that I was sleeping; I wasn't), I didn't see any birds of fire. Anyways. The Firebird was a sci-fi fantasy ballet. Even as someone who has only really seen a few ballets, seeing something different was welcome. They made use of the giant screen to create a moving backdrop of space and the costumes were shiny and sharp instead of soft and pretty. So definitely a strong visual tone. I had mixed feelings about the first scene. The choreography was pretty (and here I am using the word) and yet I didn't entirely understand it within the context of the plot. There was that sensual element to it and yet this part wasn't the love story and it was one woman with a group of men . . . so I'm not entirely sure how I feel about it all. Maybe it's just a case of the plot not coming through visually without reading it in the program (which, quite frankly, I always think it's easiest to read the program). That first scene felt more sci-fi, while the second scene brought in more of that high fantasy feel. While I'm running dry on specific comments, overall it was a beautiful and visually different piece. When the Prince and the Princess had their scenes together, they did portray that falling in love concept (of course love was the theme in both pieces since this show was right around Valentine's Day). Something about it felt heavily conceptual, if that's the right word. This was why the plot didn't always necessarily come across just from watching. It fits, though, for both a visual (as in non-verbal) piece and for a fantasy piece. Since I do like both fantasy and sci-fi, I enjoyed The Firebird. I'd see it again given the opportunity. It remains possible, though, that apart from the novelty of The Firebird, I may have liked La Sulphide more. It's the woods thing, probably: I have a weakness for love stories in the woods. Ever since I had the Rose Petal Petits Fours from Valerie Confections a few years ago, I'd been wanting to try some of their Valentine's offerings. So since today is the year for everything, this year we have their Grand Homme Assortment. While the Grand Elle Assortment is very pretty, I thought that more of these flavors sounded appealing. Visually, though they have more of a standard look of heart shapes, they're still attractive. Almond Toffee Hearts - These are the biggest hearts, so there are only two of them. I could go for a whole box of these. They're milk chocolate with little toffee and almond pieces. Caramel toffee flavor, nice and strong. This toffee isn't the hard kind; instead it has the perfect crunch and delivers the taste of sugar and vanilla, along with salt from the almonds. The milk chocolate wraps it all up in a flawless example of a high quality confection. Caramelia Hearts - These blend in well with the Caramel Truffles, so it can be hard to tell them apart visually. The Caramelia ones are essentially a twist on plain truffles. They come with a light caramel taste and a super rich, vanilla ganache flavor. Also milk chocolate, so another sweet one. Caramel Truffles - If you have these in two bites, they can break kind of awkwardly. The bottom is thicker and the rest is fairly thin. In fact, I do also have to note that with one of them, the bottom stuck to the paper, so the whole thing broke apart when I tried to pick it up. The caramel is gently free-flowing and of the darker flavored sort. No touch of salt. The chocolate here is dark. Naturally, I would prefer the milk chocolate because I tend to prefer milk chocolate when it comes to confections. This chocolate, though, isn't bad (some dark chocolate confections I can't even stand); it tastes much like Ghirardelli. The darker tone does go well, though, with darker tone of the caramel and also helps to keep it all from veering too much into the candy-confection side. Scotch Truffles - There are seven of these round truffles, so definitely the most of these. You get that alcohol hint right away. It's strong and yet also toned down enough that it doesn't overwhelm or take over the chocolate. In fact, they go together quite well. The Scotch enhances the rich concept of the ganache, giving a similar effect as a Champagne truffle. So quite nice; probably most people won't mind having the greatest amount of these in here. Personally, though, I'd have preferred more Almond Toffee Hearts or maybe Caramelia Hearts. Black Pepper Truffles - Just three of these squares. The only pepper is that dash that's visible on top. The ganache is super smooth. The black pepper taste comes in when the chocolate is almost melted, because of course it goes quickly since it's mainly ganache. You can taste it but it isn't so strong that you're hit by coughing and spiciness. It's just kind of a warmth and a flavor. So here we have an example of subtle use of a strong ingredient. Just a touch of pepper and that's all that it needs. If it were stronger, it would make it more of a novelty and also not as good. As it was, this truffle made a nice addition to the mix, something a little darker to balance out the sweet chocolates. And what did the homme think of the chocolates I chose? Well, I only got his opinion on three of them. Reluctantly, too, I might add. The almonds in the Toffee Hearts were too much for him; he said if he wanted healthy, he'd go to Whole Foods. As for the Caramelia Truffles, he liked the outside until he got to the ganache on the inside. He said that truffles sound like something British (they're not British) and aren't they something that pigs help you find in the forest (chocolate truffles are named after such truffles, yes, but they're not the same thing)? And the Black Pepper Truffles, well, I tried to give him the half of the truffle that didn't have pepper on it. What is this, Fear Factor, he said. He said that it tasted exactly the same as the Caramelia Truffle, except darker, he could taste the blackness in this one. Well, you can't win them all. 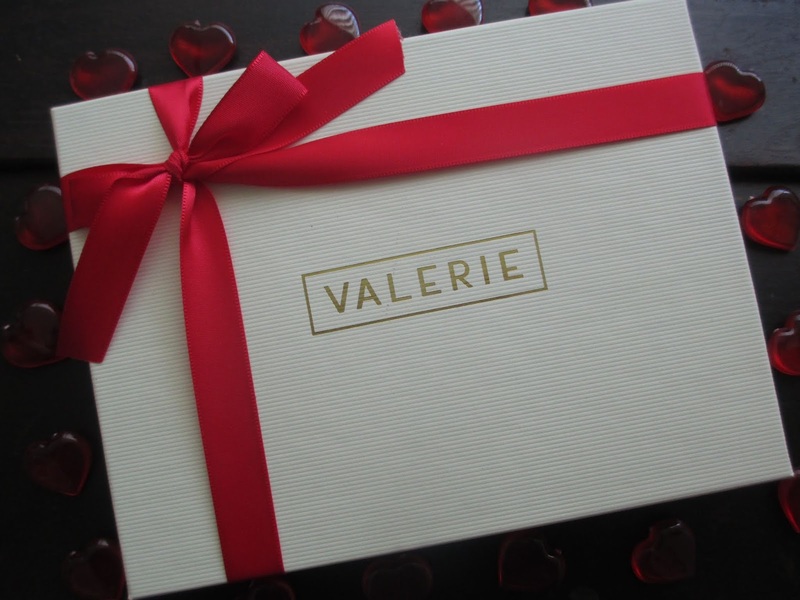 So while I suppose that yes, you do have to know your audience, overall I'd say that Valerie Confections is a wonderful example of gifting chocolate. They make confections but on a high quality level that stunned me last time and stunned me again this time. They keep things simple and do it all well--and quite beautifully, too. In an experiment, this will be possibly the start of a new chocolate series, the two perspective chocolate review. I'd intended to start with a chocolate I had gone over before, but it would seem that I never in fact wrote up a review on Taza's Cinnamon, even back on Chocablog. But I have talked about Taza, Taza the brand of stone ground chocolate. So I'll just go with that background since this really isn't going to be a regular chocolate review. While, to me, cinnamon and chocolate are a natural combination, and especially natural for Taza, to my fellow taster it was a new combination, hitherto only tried a couple of weeks ago in the seasonal Cinnamon Milano cookies. Stone ground chocolate was also new, as in fact was, well, most of the type of chocolate that I go over. So we went in with someone who was very familiar with the product and someone to whom it was completely new. While the grainy texture of Taza greeted me with its crumbly, sugar graininess, he said it reminded him of grains of sand at the beach. Not quite how I had thought of stone ground chocolate before, though the difference is strong from the smoothness of the usual, more processed chocolate. All of this talk of chocolate texture launched an explanation from me (involving the cocoa pod brought over from a shelf in my office) about how chocolate grows from a tree and it's a seed called a bean that comes inside of a white pulp in the pod and that's dried and ground up, etc. and has sugar added to it. This tangent created a new identity for the beautiful cocoa pod: he named it a piece from a sci-fi horror movie, saying that it looked like something an alien would jump out of. It is called a pod, after all, right? Then I made some hot chocolate because, of course, Taza lends itself well to hot chocolate. That is, you can make hot chocolate out of pretty much any chocolate bar, but Taza's style is just like Mexican hot chocolate. I went for a quarter disc to a quarter cup milk, which ended up being a little weak. I just hadn't wanted it to be too strong. So the hot chocolate option was somewhat of a failure; there wasn't much chocolate to taste there. Back, however, to the chocolate bar. What we did both agree on was that there wasn't much cinnamon flavor. Possibly this might be because the chocolate was getting a little old; maybe the cinnamon had faded. 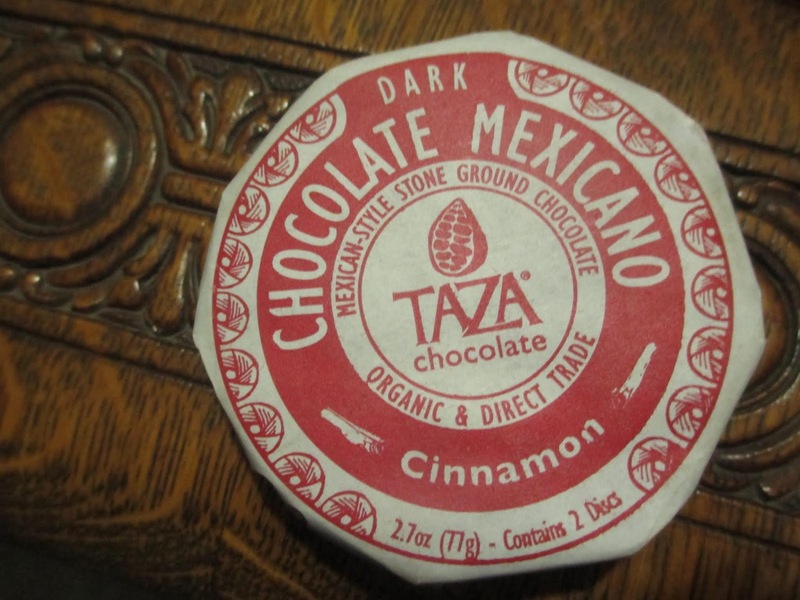 It's been long enough since I had Taza's Cinnamon that I don't remember if the cinnamon flavor is usually stronger. Flavor aside, though, Taza is unique enough for most of us that it's always worth a try if you've never had their chocolate before. It can definitely be a conversation piece. I like to say during the winter that I have a sleeping dragon at home. A bearded dragon, that is, and she is not so fierce or mythological as the name dragon would suggest. Still, the phrase remains fun. Though it's still winter, she is easing awake now. Some fresh food that I gave her disappeared not on the first day but on the second. And what I gave her today she ate right away. Now she's back in her spot looking fairly still, but that's the bearded dragon way, after all. Stillness. She's waking; I can tell. While the rest of the country is in the extreme cold temperatures, today has been one of those beautiful, almost warm winter days. No wonder the dragon has awakened. Her eyes peer at me, like she knows who I am but is still sort of getting to know me again after the long sleep. Still reminding herself that she's comfortable around me. Her eyes gleam in black and gold. Maybe she isn't so non-mythological after all: there seem to be deep secrets in her eyes. Maybe she learned them while sleeping, and now she has awakened to take on the world with her new knowledge. What an interesting journey into the world of opera this has been. It began with Don Giovanni at Santa Fe Opera and then I started in on Arizona Opera two years ago with Madama Butterfly, which has remained one of my favorites. That piece broke my heart. So two years later, I found myself watching another story of love and tragedy, Verdi's La Traviata. It's funny. The difference in story between the two was likely quite fitting a difference for me two years ago and today. So siting watching La Traviata this weekend was like swimming in a strange blur where everything in me was blending with everything in the opera. 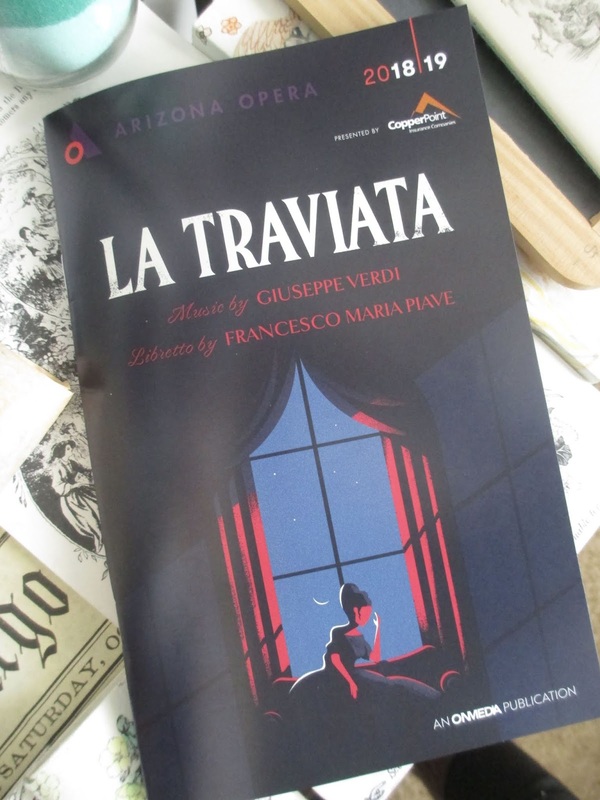 I thought it was just me until I read all of the material in the program that comments on Verdi's way of reaching the audience with relatable, real life themes. I felt it. In my observations over the past two years, I have observed that I like Puccini much and Rossini not as much. So I've definitely started in on what style of music I prefer. Verdi was different from both, though I would say more like Puccini than like Rossini. I kept on noticing (again, with my unmusical perspective) how the singing would come to a climax that was then matched by the orchestra. It was very theatrical, the way that the two matched like that. Emotion plus, well, louder volume. I always like to say that the sets and costumes were pretty--this time I couldn't even pay much attention to them. I was just reading the lyrics and listening to the music . . . and yet I can't even remember much of the music now. (Though I think I will maybe look up a recorded version to listen to again.) Yet still it caught me up in that strange blur of emotion. Sara Gartland as Violetta led it all; I feel like I was watching an ode to her life and her final discovery of love and her acceptance of that love at whatever cost, even the cost of pain and heartbreak. David Blalock as Alfredo did also bring in some sweet, sweet tones that helped to create that feeling of love. I was expecting more tragedy to the story, I admit. Maybe because I was expecting more, this didn't feel "that bad," even though of course in real life it would be. I think this is because the main effect, for me, was Violetta's choice to take this love that she has with Alfredo at whatever cost. So everything else kind of fades away because their love was the point and even any tragedy that accompanied it somehow only made it sweeter. But I guess that perspective is the perspective of a literature student who finds beauty in the painful things, too. So very lovely, definitely one of my favorites. Now for something even more different than just a little different from the norm. This is not only stretching my chocolate standards but also stretching what exactly we mean by chocolate. Which I suppose is fine given that I've also talked about chocolate candles and lip balm and notebooks. Today's unusual item is the Choc-o-saurus Freeze-Dried Chocolate Ice Cream with Chocolate Chips from Astronaut Foods. Dinosaurs and chocolate, I mean, I couldn't resist. I've never had freeze-dried anything, except for things like strawberries that don't entirely count because freeze-drying them is just a specific way of drying them versus freeze-drying an entire processed food. So this was an entirely new thing to try. Inside the pouch is another pouch of paper. The packaging explains that there are slits in the paper "to facilitate processing" and that the product will naturally be slightly broken. Wasn't too broken, though. A bit but not much. What took me by surprise (although I suppose it shouldn't have) was how much it smells like chocolate ice cream. Specifically partly melted chocolate ice cream. It looks like ice cream, too, which also shouldn't be surprising given that, well, it is ice cream, just dried. The drying process does give it kind of that honeycomb look with the slight air bubbles (by honeycomb I of course mean the toffee-like honeycomb, not the honeycomb made by bees). It feels light and weightless in the hand. There are two ways to eat such a food. You can leave it in your mouth to melt. In this way, it will legitimately become like ice cream except that it isn't cold and it almost feels a little stickier somehow. It's strange. Or you can chew it a little. With this method, it will somewhat at first like a malt ball except that it's softer and melts more and then does also become much like ice cream. It's a very creamy, chocolatey type of ice cream. I at first forgot about the whole chocolate chips thing, maybe because I had small pieces on the outside that didn't have any chips or maybe because they're small enough chips that they kind of just blend into the whole effect. When I did notice them on their own, well, they were nice as chocolate chips but in truth they are terribly cheap chocolate. Which is entirely to be expected, so that's all I'll say on that. So this is just one of those products that's very weird but also kind of cool and fun. It's a novelty product and a gift shop product. It isn't something you'd buy all the time. But I would recommend getting it once if you come across it. Because chocolate and dinosaurs--why not? I'm not a techie person. I'm not into all the new things that come out. I don't play video games. But you know, when virtual reality became reality, I was excited for that one. Sci-fi had genuinely come to life. I'd like to say the Holodeck had come to life, but in actuality VR is more like (that which even has the exact same name) VR in Earth 2 (I'm sure there are plenty of other examples, too, but that's the one that comes to mind for me). I remember when I watched that show a few years ago and I said that VR was cooler than the Holodeck--and then VR became real. And yet I didn't even try VR until yesterday. I don't know. I guess it's one of those things where I wasn't going to buy it myself and I never got around to trying it anywhere else. So yesterday. The first game felt a little more like Tetris in a way. When I used to play Tetris on my Razor (a slim cellphone from back in the day for any who are unfamiliar), that tiny screen became my whole vision because I was so focused on the game (I was pretty great at Tetris, a skill that comes in handy when you're packing groceries into your shopping bags or stuffing the trunk of your car or packing a suitcase). So that first game felt kind of like that. The game was all I saw but that's kind of how it is when you play a screen game, anyways. It was cool, though, because you're using your hands and arms more than just your fingers. The second game was a set of them. I just tried a few here and there, the carnival games that I'm terrible at, anyway, so of course was pretty bad at in the game. I probably had more fun on the home pages of this one, looking around at all the scenes around me. You turn your head and there are more things over there. You look up or down and there are things to look at. If someone's standing next to you in reality, you know they're there but they're not really there because they're not what you see next to you. It's crazy. The last game I tried within this set was a little more interactive in the way that only VR can be. It was climbing. You're climbing across ropes and against walls/cliffs. So you're changing scenery. And you look down and you see down and it's amazing, even though it was animated style imagery. When you fell, you would "die" and the world would fall around you. I kept saying, I like dying, that's fun. Just seeing everything fall was so cool. And then in the end when you finish the course, there's a crown that you grab and if you waved it, there were stars. So I was just waving my crown and watching the stars fall. It's weird because there's something tangible in your hand and yet there isn't. I can see how people get addicted to things like VR. They're really cool, no mistake. But I'll stick to it as just a novelty, something for every so often and not for every day or every week. It's amazing to enter another world but I also want to keep living in this one. Their blood is dripping red. The dried rose petals are the most exquisite of all. January tends to be the coldest time in Arizona. Even in the Phoenix area, there is that week or so where the lows go into thirties and the highs stay at the fifties or forties. We've just moved out of that spell. Now we're in a warm spell. The jackets (and umbrellas) are gone. Now everyone is outside riding bikes and enjoying the weather. It got to 70 today--even though the high a week ago was 25 degrees lower. There are desert marigolds blooming all around, as if it's spring. A little girl gave one to me at work the other day. Where there were clouds covering the sky, the sun is beaming out. Even my bearded dragon awakened and flopped onto her sand, only to end up back in the same spot where she's been sleeping for the last couple months. And that will be it, won't it? The warm spell will end. The rain will return and the cooler temperatures will come back, too. Maybe we've had the lowest of them, but we'll at least have cause to bring the jackets out again. Spring isn't here yet. While such weather can be odd or even a hassle, I love the bipolarity of it. Ups and downs. One thing and then the opposite. Something you like and then something you don't and then you don't even know which you prefer because they keep interchanging. Ups and downs and interchanging. So much that you don't even know which you prefer. A kaleidoscope. Life as a kaleidoscope. Always changing, always the same. Good or bad? Negative or neutral? Neither, in a way: you and your own perspective can be the constant, the thing that holds it all together. After all these years of chocolate reviewing and making up categories of chocolate (candy, confections, novelty, artisan, etc. ), I've decided to add a new one: fine foods chocolate. This Coffee & Cardamom bar from Eclat Chocolate is one of the chocolates that kind of breaks my rules about going for the more ethically-sourced cocoa products. It isn't even organic. It's so far apart from the usual chocolate style going around that it has no info about cocoa origin or the flavor notes of the chocolate or any of that, just a mention of the cocoa percentages. This one is a combination (not a mix) of 54% dark chocolate and 33% milk chocolate. The packaging gives that sleek, fine foods style rather than particularly the fine chocolate style. While it's very pretty packaging, it just looks different. Even the little window that lets you look in at the chocolate (which is honestly pretty convenient) is more reminiscent of crackers and cookies and things like that than chocolate. Look at that bar design, too. I appreciate its singularity. The alternating stripes of milk and dark chocolate and the cocoa pods and leaves are quite striking. 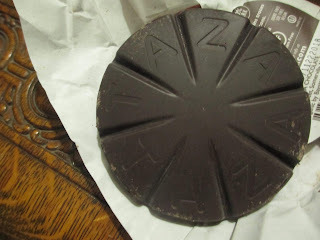 Sometimes when a chocolate is more of a food than a chocolate, the bar's design ends up being fairly plain or commonplace. The aroma is fragrant. The effect here is that the fragrance comes from the chocolate's own flavor notes rather than necessarily added flavor. Though of course you know that it's all coming from the added cardamom and coffee. I tried to break off a piece that included both types of chocolate. I got some of that warm cardamom taste and then started crunching on coffee. Coffee comes across the strongest by the time the chocolate is mostly gone. For the second piece, I tried to get a bigger one and in this way was able to taste more of the milk chocolate, this time paired closely with the taste of the cardamom. I would call this a standard fine foods milk chocolate, nothing particularly noteworthy on its own but not bad. I'm not seeming to be able to pick up the dark chocolate specifically. It's too low of a cocoa percentage to distinguish from the milk chocolate right next to it. So the milk chocolate naturally ends up registering more. I keep on chewing this chocolate more than letting it melt, both because I'm trying to get all the flavors mixed in and because it has those coffee bean pieces. So definitely a munching chocolate. It's good. There is a good balance on the cardamom, which is present but not overwhelmingly strong. The cardamom also makes the coffee, which is quite the common flavor combination with chocolate, more interesting. Chocolate like this is meant to be shared with strong flavors like these; otherwise, it would have no interest. So it's definitely a fine foods chocolate (since the focus is on the added flavors and not on the chocolate), but it's a good fine foods chocolate. Do you return to the same book again and again? I had been reading Jane Eyre about every four years. The exact same copy that I started with in middle school--even though I now own many, many copies of that book. I underline and I write things in the margins and I look back at what I noticed before. And each time, I brought with me a new perspective and so the book grew and developed with me. It's now been five or six years since I read it. I'm not reading much these days, so there are plenty of other books I should probably spend my time on. But I'm feeling very much overdue for another reading of this book that has begun to feel like my soul. What will I bring with me this time? In middle school, I liked the dark, Gothic elements. In high school, I liked the fairy tale quality. In college, I liked Jane's growth as a person. Whatever age I was and whatever I was learning, I could take with me into this book. It's funny, maybe now I'm going to really get into the whole Bertha thing. My perspective on Bertha is that she is, figuratively, Jane. She is what Jane would be if she stayed with Rochester at that point in their relationship. That's why Jane had to leave; she couldn't become Bertha. Later, things changed for both Jane and for Rochester and they were able to come together on better, healthier, equal terms. But at that point, Bertha was the thing within Jane that she had to beat and destroy. And I've been really into that concept of beating down things that you know try to destroy you. And . . . maybe more. We'll see. I don't know, I think this book that is so familiar will be like it's fresh and brand new this time. The book that grows with me. I'll preface this by saying that I haven't yet watched the New Year's episode of Doctor Who, but I have watched all the other new episodes. The idea of this character being female for the first time sparked, well, lots of conversation. Strong opinions. While I didn't exactly feel the necessity for introducing a female Doctor, I didn't want to feel too deeply about it either way and in any case, I thought it would be better to just wait and see how it all went. After all, I wasn't the biggest fan of the twelfth Doctor, so I was probably already okay with the idea of liking some of them and others not so much. When I started watching the show, though, it was like we just had another Doctor. They don't try to make much of the fact that she's female and that's the point: it's still the same character. And Jodie Whittaker also just approaches playing the character; she doesn't try to infuse the character with femininity on purpose or anything. She just is and that was the best way to go about it. So anything female about her is just a natural part of it all. There are, of course, the moments when it does come in to the plot. If they're in historical places, then of course it makes a difference for the Doctor to be a woman than a man; the believability would go down otherwise (I mean, we all know this is fiction, but you know what I mean). Still, even when it needed to be an aspect of the plot, I appreciated that the plot never revolved around this. Thirteen's companions are more reminiscent of the First Doctor's posse. Not just one companion to flirt with aka. Rose and Ten (though I did love them) or Amy Pond and Eleven. A group. The Doctor is great when he has a whole group, not just one companion. That also gives more space for the plot of each episode; you have more material to work with. There was something fresh about the whole feeling of this season. Getting a new writer in obviously reworks the whole tone. It was great to have episodes that were just adventures, like before. Everything can't be a facing-the-end-of-the-universe thing because that gets old, as does having the same character die multiple times. It's fun at first and then it's draining and then it has so much weight that it has no weight. So it's better with such a long-lived show as this to go back to that lighter weight. To have the peril within the episode and that's it. To have the fun skittering over to the past or a new planet or whatever. They also had a good mix of settings. Historical, present, future, Earth, not Earth, space, land, aliens, no aliens (or kind of no aliens). That's the fun and imaginative element of the show. So I was pleasantly surprised by this new season. I liked the Doctor again, was entertained once more by that character. And I enjoyed just going along for the adventure of each episode, just a fun hour of exploration.